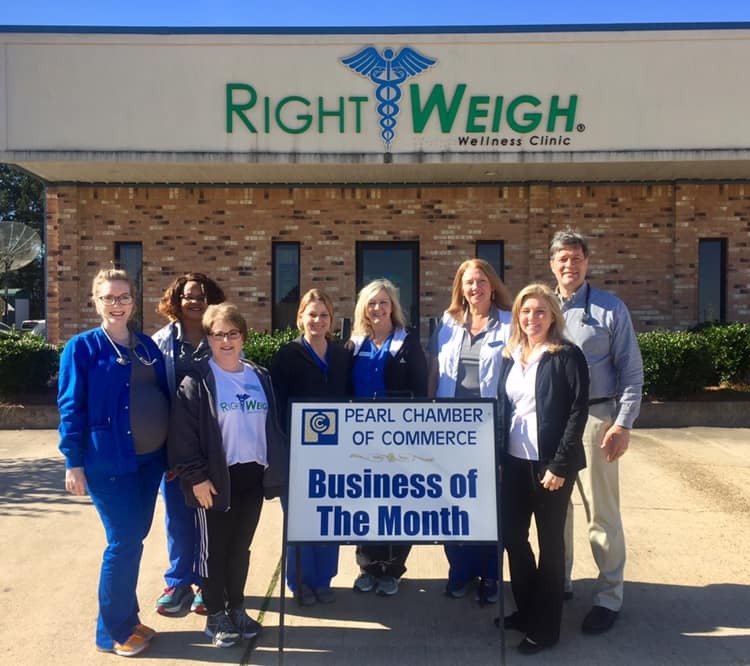 The Pearl Chamber of Commerce January Business of the Month is Right Weigh Clinic, LLC located at 309 Airport Road in Pearl. Right Weigh is a weight loss clinic that specializes in education and nutrition for those seeking to lose weight and be healthy. Local owners Jeff Hubacek and wife Karen (Pearl High School grad) have a staff of 6 Registered Nurses and 2 staff members with Exercise Physiology Degrees. Dr. Hubacek is one of a few Board Certified Physicians of the Mississippi Obesity Medical Association. Right Weigh offers classes and workshops for diabetes, ketogenics, inflammatory diseases, cholesterol, fasting, cooking and much more. They sell medical grade supplements and appetite suppressants at their in house pharmacy. Right Weigh also offers workshops on site at local companies and churches. For more info go to their website at www.rightweighclinic.com, like their Facebook Page or call 601-936-2887. Copyright 2015 Pearl Chamber of Commerce. All Rights Reserved.